I have been waiting to make this recipe most of the summer, just waiting for the cherry tomatoes to be ready for the picking from the garden. 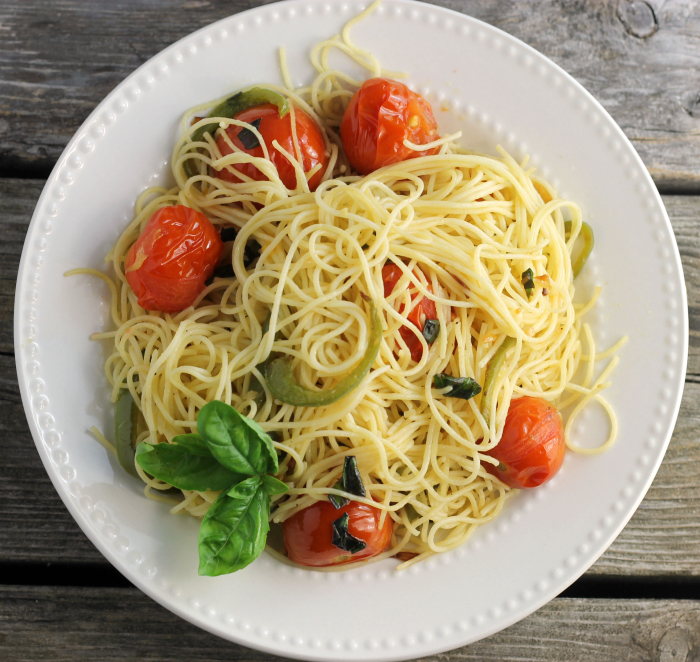 This cherry tomato basil angel hair pasta is a meal by itself or add some chicken if you want some protein. Yeah, I really have been thinking about this recipe all summer long. I have been watching and waiting for our cherry tomatoes to ripen so that I would have enough to make this simple recipe. But just as they began to ripen they disappeared. We think that the deer decided to feast on these sweet little cherry tomatoes. My dreams were shattered until I went to my mom’s house and saw all of her cherry tomatoes. She was generous enough to share some of her tomatoes with me. Granted they were not the kind that I had, but they worked quite nicely. It really has been a year with our garden… the rabbits and the deer have been feasting quite often on all the vegetables and plants. All of our green beans, snow peas, and dill are all gone. Tomatoes not quiet all eaten by the deer, but a good deal of them. Next year I think we will need to put a fence around the garden to prevent this from happening again. Well, at least they didn’t eat my basil that is one good thing. As for this recipe, it is simple, but perfect for a light meal. Maybe serve it with a salad or if you want some protein, add some cooked chicken. Oh, another thing I think that I liked about this meal it comes together quickly, so it is perfect for those busy weeknight dinners. I love simple dinners at the end of the summer with fresh veggies and herbs from the garden. 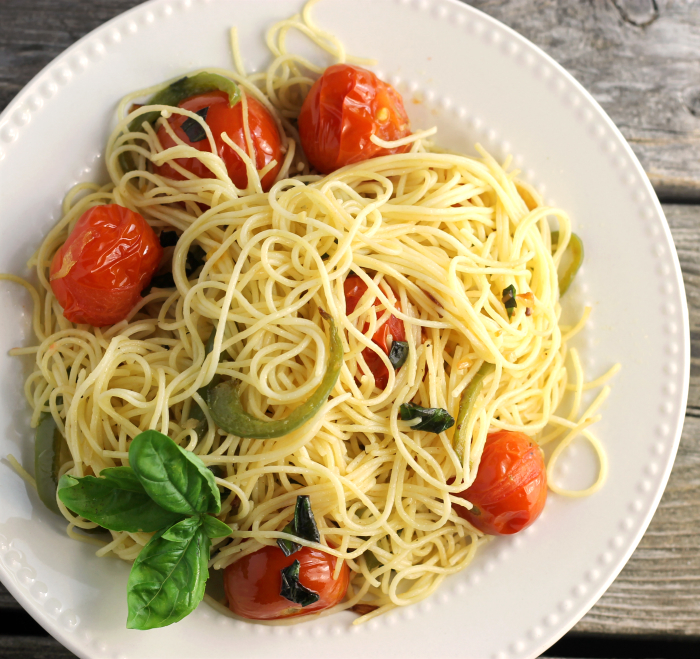 If you agree, I hope you will try this cherry tomato basil angel hair pasta. In a large skillet heat 2 tablespoons of olive oil over medium heat. Add the green pepper and onion, saute until softened about 2 to 4 minutes. Add the garlic and tomatoes continue to saute the vegetables until the tomatoes softened and crack, about 4 to 6 minutes. While cutting the veggies cook the angel hair pasta according to the directions on the box. Once the vegetables are completed toss in the cooked pasta and basil. Vegetables may take less or longer depending on how they are cut. The cherry tomatoes that I used were larger, so they did take longer than smaller tomatoes would have. The squirrels always get our tomatoes. Although not usually our cherry tomatoes — we actually had a decent crop of them this year. I make a similar dish, but forget to make it this year! Still time, though — thanks for the reminder! 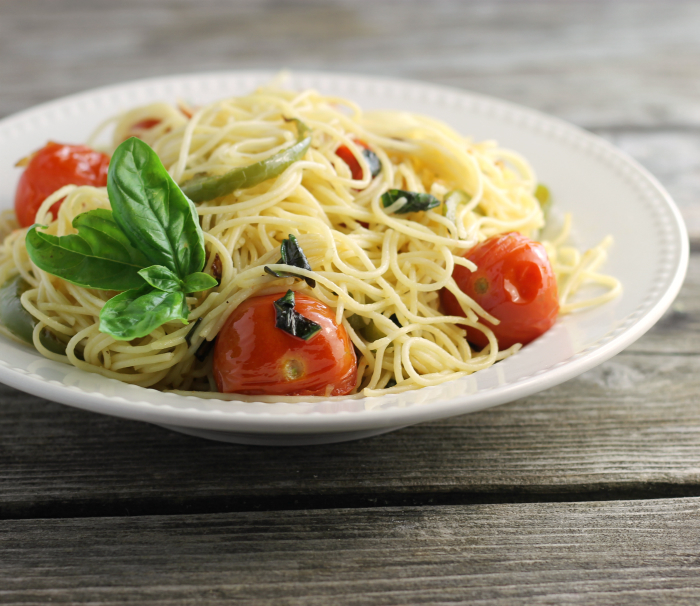 Simple and delicious…must be particularly fresh since you used the homegrown cherry tomatoes. Deer, rabbits, etc. ate so many of our plants this year – I was really disappointed! Your pasta dish looks delicious! I love, love, love tomato basil combo. Yesterday I roasted tomato basil sauce (four hours and oh my yum). Up next, tomato basil crackers. You just cannot go wrong with this classic combo. So cool that your mom shared with you. She’s a keeper. 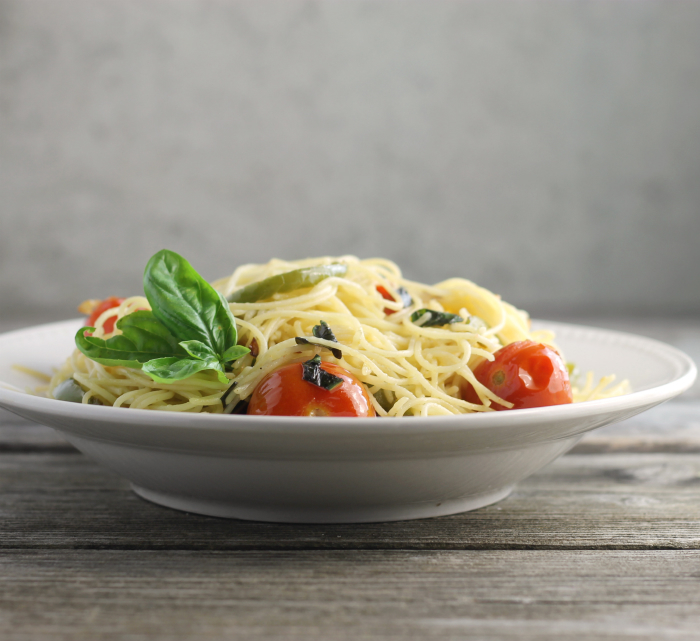 Dawn, this angel hair pasta is just a classic…simple and yet so tasty…I love it! Awesome pictures! Oh gosh, I totally know about the garden troubles. We have a fenced yard (and a fenced garden), so no deer troubles…but the rabbits have done a number on our garden. Fortunately, they didn’t touch the tomatoes and basil. I think this combination sounds amazing for a tasty dinner one night this weekend. I love angel hair pasta!